Location, convenience, guest services, price. It is EXCELLENT! One of the best in the Greek Islands. Onsite property manager (Anita)was kind and responsive. We'll be back! Had an excellent stay. Dimitra was very pleasant and helpful. The room was of excellent standard and location perfect. Would highly recommend these apartments. Without question the very best accommodation we've ever had in Greece - and we've stayed in dozens of places. Wonderful, huge bed in an ultra-modern apartment with every possible facility. And all of them worked, even the loo snd the basin plugs. Magnificent shower. And Dmitra gave us every help.poddible. The view outside is something else. Sitting out on the balcony with a glass of wine overlooking the bay seriously takes some beating and we get about! Very very impressed with Vithos Apartments and absolutely no complaints! They organised transfers to and from the ferries for us even at the terrible hours they operate; and Dimitria still got up to let us into our room at 5 am. She was a wonderful host, even giving us a ride to Livadi beach one day when she had to go there herself. The apartments are impeccably clean and look brand new. The bed was super comfortable and the outdoor areas are right on the water overlooking the little harbour and beach. It i s 2 minutes walk across the beach to supermarkets, cafes, restaurants and all you need. For eating can highly recommend Luna for breakfast and Maistrali and Safran for dinners. Only had 2 days but a lovely peaceful place to stay on a lovely quiet island. Dimitra is a very kind and helpful host! Our problem was quickly solved. Everything perfect, genuine and beautifiul island, amazing apartmets! The view from the aprtment leaves you speechless and the apartment is new and decorated with taste and provides all the comforts. Cleaning is done everyday and the people running the place are very nice and caring. The position is close to all anenities. For me the best place in Astypalea. Fantastic location looking out to the bay, town and Kastro. Large terrace and all facilities in apartment. Lock in a great price for Vithos Seaside Aparthotel – rated 9.6 by recent guests! Enjoying a beachfront location and only 150 feet from the center of Pera Gialos Village, Vithos Seaside Aparthotel offers self-catered accommodations with Aegean Sea views. Free WiFi is available throughout. A restaurant and a mini market are found within proximity. Simply yet tastefully decorated, all apartments at Vithos are bright and open to a balcony. Each comes with a seating area with sofa and a fully equipped kitchen with stove and dining area. Ironing facilities and a washing machine are included. A bus station providing connection to different parts of the island is 500 feet away. The Venetian Castle of Astypalaia is at a distance of approximately 0.6 mi. 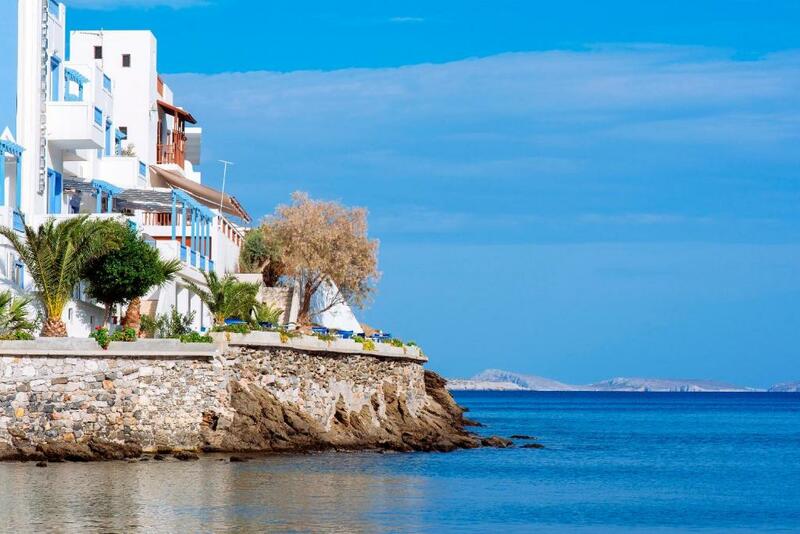 Astypalaia Port is 1.9 mi away and Astypalaia National Airport is a 20-minute drive away. When would you like to stay at Vithos Seaside Aparthotel? Elegantly furnished suite with a king-size bed in each bedroom, a fully equipped kitchen with dining area, and a private terrace offering a magnificent view to Chora, the Venetian castle and the beautiful beach of Pera Yialos. This suite is set on the 2nd floor of the building. Offering direct access to the seaside courtyard, this elegant studio features a fully equipped kitchenette and luxurious bathroom with shower. It features magnificent views to Chora and the Venetian Castle. This studio is set on the ground floor. A comfortable apartment bedroom with a king-size bed, a fully equipped kitchen with dining area, a living room with double sofa bed, a luxurious bathroom with shower, and a private terrace offering a magnificent view to Chora and the Venetian Castle. It offers direct access to the seaside courtyard. Vithos Aparthotel is a small beachfront complex, located right on the sea front at Pera Yialos beach, offering 13 self-catering studios and apartments boasting an exquisite view of Chora and the Venetian Castle. Brilliant white dominates indoor and outdoor building surfaces, modern living spaces feature enhanced privacy and comfort, while the refreshing sea breeze boosts the unparalleled sea view. Pera Gyalos, that once used to be the main port of the island, is located at the foot of the hill, on top of which stands the Venetian Castle overlooking the main village of the island (Chora) that spreads out amphitheatrically on the hill’s slope. The area of Pera Gyalos boasts a lovely pebbly beach, fringed by tamarisk trees, that is well protected by the wind. Gift shops, traditional restaurants, coffee and pastry shops line the beach and can be visited throughout the day. The archaeological museum, located right in the heart of Pera Gyalos, houses a small collection of artifacts narrating the island’s history through the centuries. Nearby, lies the blue domed Church of St.Nicholas with its lovely courtyard. Since 2005, when the new port of Agios Andreas was established, Pera Gyalos plays host to sailing boats, yachts and fishing boats in its marina area, as well as to the local ferry connecting Astypalaia to Kalymnos. Excursion boats leave the Pera Gyalos’ pier daily throughout the summer holiday season to take visitors across the bay to the nearby islets. Many of the public services are concentrated in the area. House Rules Vithos Seaside Aparthotel takes special requests – add in the next step! Vithos Seaside Aparthotel accepts these cards and reserves the right to temporarily hold an amount prior to arrival. Please inform Vithos Seaside Aparthotel of your expected arrival time in advance. You can use the Special Requests box when booking, or contact the property directly using the contact details in your confirmation. There is nothing negative to say. It was perfect! Very spacious with great views. Nothing! But a hairdryer woild be good! Very good location, friendly staff. I liked that nobody tried to change my towels while I was there. Good bright light for reading. The apartment was called a "Superior" one bedroom apartment, but it was a little tired and in need of updating. There had been a mix up in our booking and we were given a Superior Studio at first, which was really smart and worthy of the status, except it was located on the ground floor behind the stairs (no view) and was only a studio. Once we were moved we had a great view but the apartment was acceptable but not great. The chairs of the balcony were not very confortable. The views were so good that we needed some nice chairs to go along with. Views, spacious room, polite host, fully equiped. What else to ask? Difficult place to get to from Port as port is opposite side of the island but we were collected and brought back to port on arrival and departure.